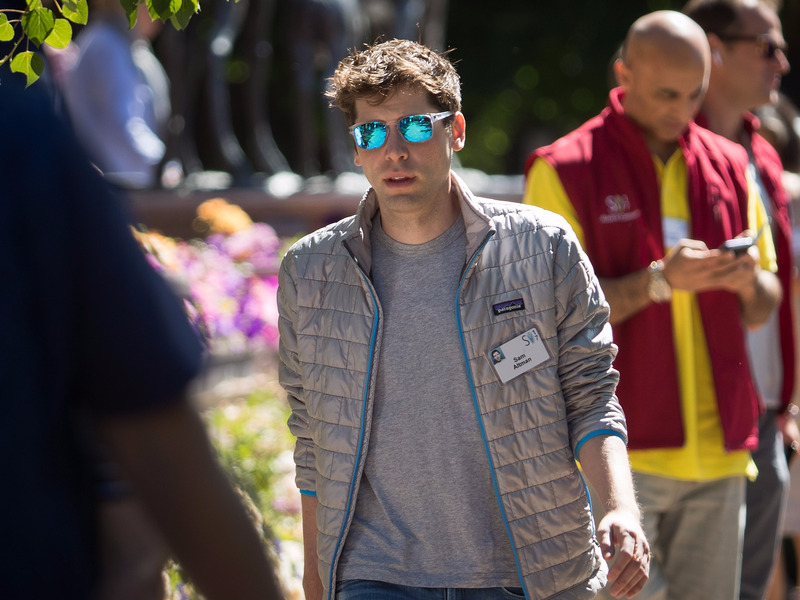 Sam Altman often finds himself imagining a brighter future. As the president of Y Combinator, the tech world's most prestigious startup accelerator, Altman makes a living discovering world-changing ideas and helping them grow into giants. YC has given life to companies like Dropbox, Airbnb, Zenefits, and Reddit. But Altman also dabbles in a host of side projects that center on making society more equal and giving artificial intelligence the means to flourish. Here are a handful of projects Altman believes could someday change the world for the better. YC is experimenting with giving people free money to avoid poverty. In May 2016, Altman published a note on YC's blog announcing his interest in pursuing universal basic income, a solution to poverty that involves people receiving a standard salary just for being alive, no strings attached. Almost two years later, YC has completed a trial study in Oakland, California that involved roughly 100 people getting between $1,000 to $2,000 a month. The study was successful enough that YC will be conducting a larger trial later this year, now including 3,000 people getting money until 2022. Altman believes the idea could spread nationwide over the coming decades, particularly as robots threaten to displace American workers from their jobs. Altman runs an AI research company to ensure robots are forces for good. Altman, together with Tesla CEO Elon Musk, is the co-chair of the nonprofit OpenAI. The organization researches and develops safe, benevolent uses for artificial intelligence. Instead of using use his tech background to create fleets of robot soldiers, Altman wants to create AI that help people live healthier, richer lives. He considers the organization one of his most treasured projects. "Because of AI's surprising history, it's hard to predict when human-level AI might come within reach," he wrote in December 2015, when the company launched. "When it does, it'll be important to have a leading research institution which can prioritize a good outcome for all over its own self-interest." He is working to make housing more affordable. A major issue Altman has grappled with is the crisis of unaffordable housing, particularly in his home city of San Francisco. However, his involvement with OpenAI could help alleviate the problem, he said. Someday, robots could be so advanced that their labor is both sophisticated and dirt-cheap. "You can imagine a world," he continued, "where you own a small piece of land, you can say, 'Hey, robot. I would like a house here,' and you come back like a month later and there's a fully constructed house built for you for free." Altman has pushed for government overhaul. In May 2017, rumors began to swirl that Altman's political interests in housing and economics had compelled him to run for California governor in 2018. A couple months later, he revealed he was actually hoping to finance someone else's run for governor, provided they agreed with his platform ideas. He pushed for single-payer healthcare, affordable housing, clean energy, skills-based education, and rewriting tax codes that favor the middle class. Set beside his grander tech visions, the slate seemed tame by comparison. But it was still part of his master plan. "It's this pro-growth, pro-innovation, and pro-distribution idea," Altman said, "where we're going to have — as we've had after every technological revolution — we're going to have to rewrite the social contract."